Why Whataburger is one of my favourite burgers, ever. No Texan will need to read this post. Because they’ll know. They’ll know as soon as they read the title. But anyone visiting Texas needs to know about Whataburger. Yes, it’s a fast food chain, but it’s unique to Texas and so adored by Lone Star Staters that you can find their signature ketchup and mustard for sale in grocery stores. I guess the point is, if you’re going to eat from a drive through, forget the red haired clown and antebellum colonel, and show some state pride! You’ll know em when you see em – giant A-frame structures painted with orange and white stripes. Kinda like a giant UT themed tent. 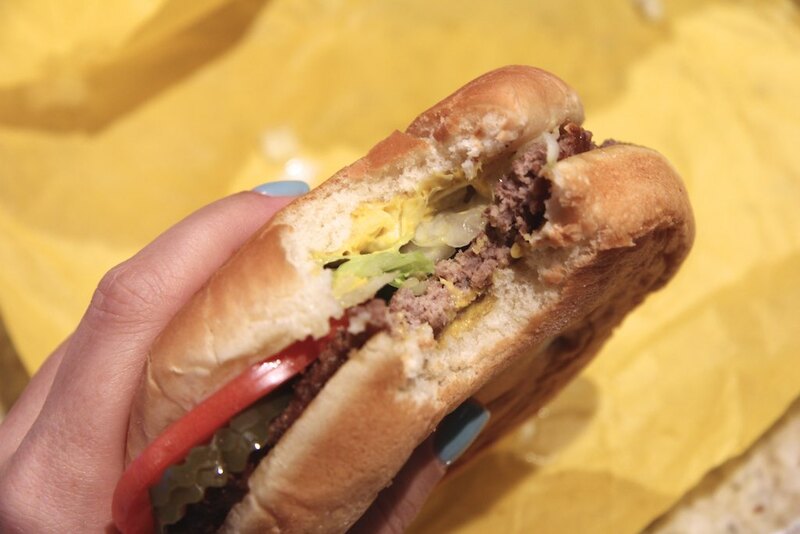 There are more than 750 Whataburgers nationwide now, and they’re all open 24 hours, so really there’s no excuse not to pull into the drive thru (and that’s before I’ve even told you about their Jalapeno Cheddar Breakfast Biscuit…). How can I describe Whataburger? It’s what you wished the golden arches tasted like. It’s a no frills, short stack, thin patty burger, designed to be consistently delicious no matter where in the Lone Star state you eat one. Topped with a thin, pliable bun that leaves an imprint when you press too hard with your finger. I have it on good authority that adding in jalapenos or green chiles also takes this baby to the next level, I like to keep it simple with mustard and basic dressing. For me, one of the reasons Whataburger will always be my go-to is the complete meal experience they offer. See, they have both diet Coke and diet Dr Pepper, which when mixed together form the ultimate soda, and they’re more than happy to custom mix for you even for drive thru. Simply, bringing that striped bag into the house guarantees you a meal that hits right in the no-frills comfort zone. Yeah, it’s not a fancy bespoke wagyu creation, but the late Josh Ozersky wrote about this best when he pointed out that not all comfort food needs reinventing, and some classics should just remain unmolested by chef hands. I’m telling you now, that overrated palm-treed Californian burger chain would absolutely lose in a match up fight, because this right here is the classic American burger feast by my standards. If you really want to make it authentic, make sure you pronounce it “waterburger”.